Strawberry Tres Leches Cake Delight is a very different style of dessert you might never have tried. Its very moist and tasty and you can cook it like a cake or a dessert. 1 1/2 cup of whipped cream. Grease an 8 × 8 inch glass baking dish with butter or line with parchment paper. Pre-heat your oven at 180 degree. Beat eggs , vanilla extract or essence and caster sugar together for 3 to 4 minutes. Sift flour , salt and baking powder twice and add this in portions into the eggs batter along with melted butter. Just beat for a few seconds until all the things are well combined. Pour in the baking dish and bake for 25 minutes or until the skewer inserted in the center comes out clean. While the cake is baking you can prepare your Tres Lecher by mixing together condensed milk , evaporated milk and full fat milk in a bowl. While the cake is hot right out of the oven. Use a skewer and poke it all over with it. Pour 1/3 of the the tres leches on the cake and let it absorb completely in the cake. Do not pour all of it at once. Pour it in portions. When one portion of it is completely absorbed then continue to poke and add the next portion till the cake takes no more. Keep the dish covered over night in the fridge. Next day take out the cake and spread the strawberry pie filling over the cake. It depends how much you want to use in it. I used half of the normal size tin. You can add less or more according to your choice. Whip cream to soft peaks. Do not over beat it at this point. Beat no more than 5 minutes. Beat cream cheese ( has to be on room temperature) till its smooth. Add condensed milk and lime juice to it and beat again till they are all mixed well. Do not over beat. You just have to mix them together. Now add the whipped cream in to this mixture and beat again till stiff peaks forms. Do not over beat or it will turn into butter that you don’t want. Fill this mixture in the piping bag fitted with any nozzle of your choice. Pipe out the filling on the top of the cake and cover it completely. 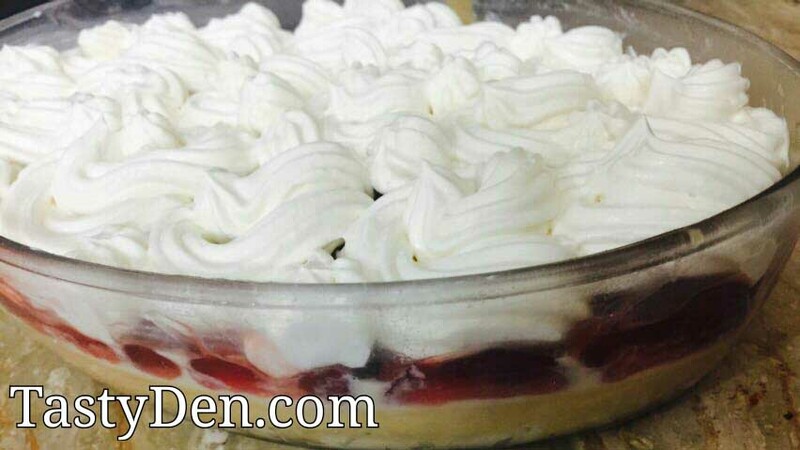 You can use as much cream mixture as you want and utilize the rest with anything else. Decorate with some maraschino cherries or fresh strawberries and serve chilled. This cake tastes best when kept for 2 days in fridge. You can use strawberry jam or you can cook strawberry syrup yourself if you don’t get pie filling. Keep it in fridge at-least over night after frosting it with cream cheese mixture.